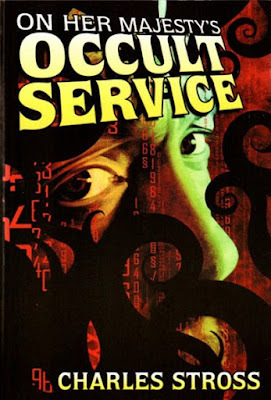 While researching (I am always researching something) the depths to which the Illuminatus Observor has bored into the Occult community, I found myself being linked into some really obscure work by Aleister Crowley. Consequently, it occurred to me that perhaps a clever way to shed more light on the Construct would be to compare and contrast what a leading Occultist as Aleister Crowley was saying compared to the more modern and "contemporary" knowledge culled from an acute understanding of Osirian based Freemasonry. What better way to go about this task than to highlight early 1900 thoughts regarding "nursery rhymes" as presented by the Setianist Crowley, and compare that to what is Osirian here at the Illuminatus Observor. One widely held belief, and I have seen this rationalized in many ways, is that the totality of "creation" holds "adumbrations" of "the truth" - or the Construct. One way this is rationalized goes something like this: since "the God" is all things, then "all things" must in some reflect the vestiges of the truth, or a semblance of "the God". Another way this concept may viewed, and I tend to understand how such might be so, is that within "the Construct", especially that one which is dominated by English, is the reality that Occult force imposed itself on the language and thus ensured that "the Truth" would forever remain for any willing to work and peer into the nature of these "things" and discern for oneself. "But he who was appointed from the military class was at once made one of the priests and a participant in their philosophy, which, for the most part, is veiled in myths and in words containing dim reflexions and adumbrations of the truth, as they themselves intimate beyond question by appropriately placing sphinxes before their shrines to indicate that their religious teaching has in it an enigmatical sort of wisdom." 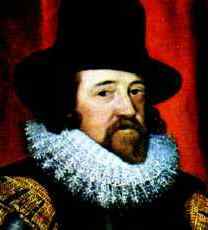 The latter, that of a "constructed reality" that reflects "the truth", we find in conversations regarding Sir Francis Bacon. "The organization or method of transmission he (Bacon) established was such as to ensure that never again so long as the world endured, should the lamp of tradition, the light of truth, be darkened or extinguished"
"Every nursery rime contains profound magical secrets which are open to every one who has made a study of the correspondences of the Holy Qabalah. To puzzle out an imaginary meaning for this "nonsense" sets one thinking of the Mysteries; one enters into deep contemplation of holy things and God Himself leads the soul to a real illumination. Hence also the necessity of Incarnation; the soul must descend into all falsity in order to attain All-Truth." A peculiarity regarding Western nursery rhymes is that they are tinged with melancholy. Whether Jack fell down and broke his crown, the baby falls from the tree top, two of the pigs get devoured, or if the sky is falling, it is hard to miss the seeming tragic themes that underly the tails first taught to children. Even the greatest of animals, the dinosaurs, tell children at an early age to "die" and "do not soar". So much can be inferred that one has to wonder if there is not a planned set of puns embed in the language, puns that do not begin to come to life until one has begun an immersion into the Occult, and in particular, the craft of the letters, aka, "Qaballa" in its various forms and tinctures. Nursery rhymes would provide a very clever and yet diabolical (or genius) method upon which to transmit knowledge, nursery rhymes themselves steeped in allegory and words that provide symbolic and dim "reflexions". "Who is this ancient and venerable mother of whom it is spoken? Verily she is no other than Binah, as is evident in the use of the holy letter H with which her name begins. "Nor is she the sterile Mother Ama -- but the fertile Aima; for within he she bears Vau, the son, for the second letter of her name, and R, the penultimate, is the Sun, Tiphareth, the Son. "The other three letters of her name, B, A, and D, are the three paths which join the supernals. "To what cupboard did she go? Even to the most secret caverns of the Universe. And who is this dog? Is it not the name of God spelt Qabalistically backwards? And what is this bone? The bone is the Wand, the holy Lingam! "The complete interpretation of the rune is now open. This rime is the legend of the murder of Osiris by Typhon. "The limbs of Osiris were scattered in the Nile. Talk about a tortured analysis! The Letter H is B is??? And B, A, and D are the 3 paths that join the supernals? Umm. No. Leave the Jewish Tree as defined to the Jews and not affix English and subjugate the letters and language to this foreign absurdity. However, to Crowley's credit, he did get the core of the analysis correct. 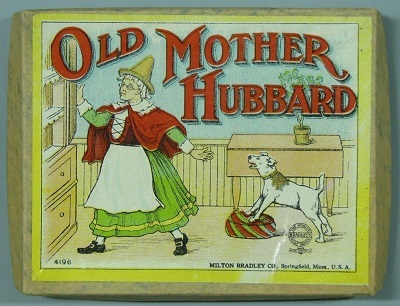 Old Mother Hubbard is referencing back to the tales of Isis and Osiris. Of course, you could not have achieved Crowley's proclaimed levels without having a reasonable comprehension of how this was all so. 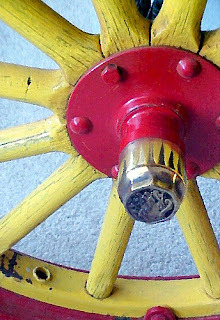 If you are going to have SPEECH, then the past tense of SPEECH is SPOKEN, and you cannot have SPOKEN without a SPOKE, and when you have a SPOKE you have in effect a HUB. The HUB BARD, therefore, is of course, ISIS, for ISIS is SPEECH is the SPOKEN WORD, wherein the SPOKE (aNd) Word reveals the Diameter and PI, for the Spoke is the Radius and thus implies the Diameter, and hence "the Word" must be Pi. "And "Peep" is Apep, the serpent Apophis. THis poem therefore contains the same symbol as that in the Egyptian and Hebrew Bibles." "The snake is the serpent of Initiation, as the Lamb is the Saviour. "This ancient one, the Wisdom of Eternity, sits in its old anguish awaiting the Redeemer. And this holy verse triumphantly assures us that there is no need for anxiety. The Saviours will come after the other, at their own good pleasure, and as they may be needed, and drag their tails, that is to say those who follow out their holy commandment, to the ultimate goal." Huh? Little Bo Peep is Feminine, but Crowley links "Little Bo Peep" to "Light" and "Apep", but Apep is the "demon" that is in opposition to Ma'at. How a demon that is opposition to Ma'at could even begin to conceivably become linked to "savior" mythology and symbolism defies all rationalism and logic, unless one is versed in more esoteric Freemasonry. Hence there remains a more logical analysis that hints at where Crowley was going, but keeps the energetical channels closer to the truth. 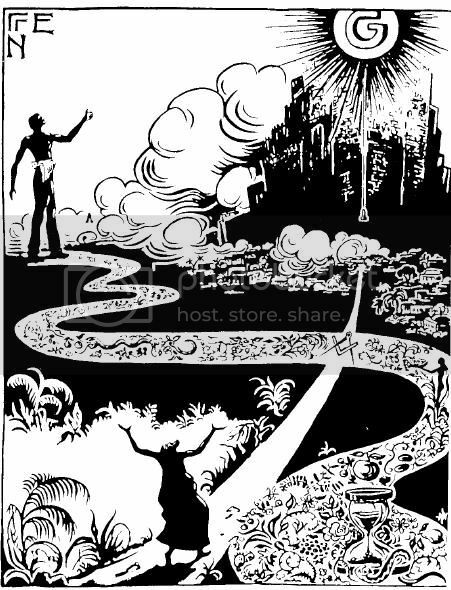 There is a held belief in FreeMasonry, albeit not universal (to my knowledge) that that which is known as "the Demiurge" takes on the properties of Jehovah as a redeemer god. It works like this: the longer one immerses oneself into suffering (material existence), the sooner one begins for the longing to escape from the suffering of the material existence and hence "seek the light". When one realizes that Jehovah makes you suffer so as to "raise you up", you then realize how beneficial Jehovah as a "redeemer god" has always been, and so you give your energy and soul over to the deity. Essentially, the concept rationalizes masochistic/sadistic deity/mortal relationships. However, I prefer to view this from a purely Osirian mindset, and hence see a more "pun"-ish nature to the tale. 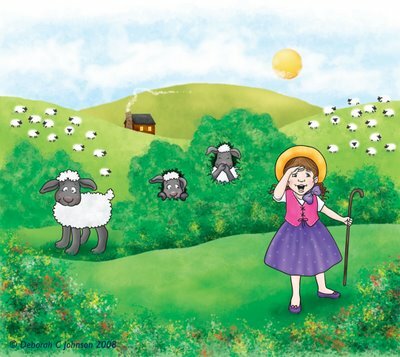 Little Bo Peep is Isis, and Isis, of course, has long ago "lost her sheep". However, there remains the vestiges of Isis within the Secret Societies and as such, the "sheep", or humanity, will not go seeking after Jehovah as a "the Demiurge" turned "benevolent savior" - an oxymoron. Rather, with time, "the Truth" marches forward regardless and mankind has no choice but to return to the Goddess "with their tails behind them". "Here we are on higher ground at once. The clock symbolizes the spinal column, or if you prefer it, Time, chosen as one of the conditions of normal consciousness. The mouse is the Ego; "Mus", a mouse, being only "Sum", "I am", spelt Qabalistically backwards. "This Ego or Prana or Kundalini force being driven up the spine, the clock strikes one, that is, the duality of consciousness is abolished. And the force again subsides to its original level. 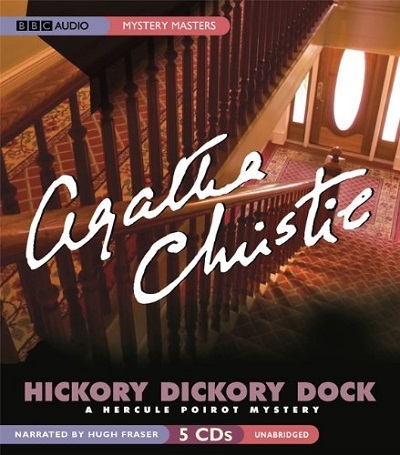 "Hickory, dickory, dock!" is perhaps the mantra which was used by the adept who constructed this rime, thereby hoping to fix it in the minds of men; so that they might attain to Samadhi by the same method. Others attribute to it a more profound significance -- which is impossible to go into at this moment..."
"This is so simple as hardly to require explanation. 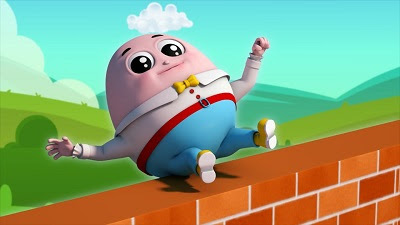 Humpty Dumpty is of course the Egg of Spirit, and the wall is the Abyss -- his "fall" is therefore the descent of spirit into matter; and it is only too painfully familiar to us that all the king's horses and all his men cannot restore us to the height. "Only the King Himself can do that! "But one can hardly comment upon a theme which has been so fruitfully treated by Ludovicus Carolus, that most holy illuminated man of God. His masterly treatment of the identity of the three reciprocating paths of Daleth, Teth, and Pe, is one of the most wonderful passages in the Holy Qabalah." "When I chose a word, it means exactly what I choose it to mean, nothing more and nothing less." This can be interpreted many ways, but as Humpty Dumpty represents the fallen philosophy of the Sun which as been broken and scattered, the use of words as Occult constructs trend to being precise, and then mean precisely what they are intended to mean, and nothing less. The flowery obfuscations of Crowley, falling back on the Rabbinical Kabballah, hardly shows a regard for the absolutes of the Craft. Based as it is on Pi, Humpty Dumpty is so simple and ingenious that it means precisely what it says. For an analysis of the Esoteric Code of Humpty Dumpty, I leave you with this video that shows precisely how the Code of Humpty Dumpty works. If you have seen this already, a revisit might be a good refresher. Regardless, for those of you interested in peering deeper into the Mysteries, as this article shows, even something as innocuous as "nursery rhymes" can be shown to embed that mystical component which we refer to as "an adumbration of the Truth". I know. "Dude. You are talking about "weddings". Throwing in words like, "esoteric constructions" is like, so-o unromantic." But hey, when the Construct can be shown to be embed into so many seemingly everyday "things", surely something as ritualistic and important as a "wedding" would, too, have its occult construction? Why, for instance, would it be called a "wedding"? After all, solve for the very core of the Occult Construct and you are sure to more rapidly come to understand the nature of the Construct itself. Let's review the basics once again. The "Construct" implies a rational crafting to what the masses term "reality". The Construct itself is built upon a conceptual, which, at its absolute core, is set against Numbers, Letters, and Sounds. There is a philosophical checkpoint upon which this whole is crafted. This "checkpoint" is euphemistically termed "the Word", but is reality is a "Number", said number being the ratio of the circle to its diameter. This is also known as "Pi". O's are regarded as feminine, while 1's are viewed as "masculine". This is a reduction of the philosophy down to its very core. The diameter cannot exist without the circumference, and vice versa. Words themselves are embed with conceptual Occult underpinnings. These underpinnings we may term as "hidden meanings" or "conceptual foundations". For example. If we say to you, "this article is a concept that is still conceptual and is in an early stage of its conception", the hidden Occult process was to highlight the 1 and the 0 through a utilization of pattern and words. 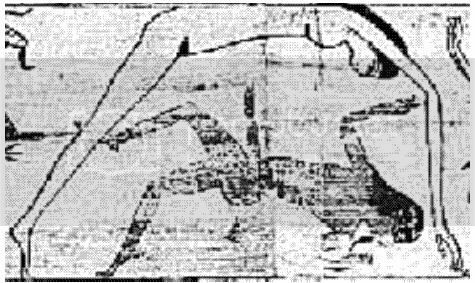 "Conception" by its very nature means "male and female", or "1's" and "0's", for in order for the female to have "conception", a uniting of male force is implied. This process is known as "building a conceptual" upon a concept. You may then expand upon the idea through invocation of the "if/then" proposition, which is referred to as "the Scales" or "the Letter E". They met here by themselves; and after discussing the matter, dedicated the letter which is fifth in the alphabet, and also as a number signifies five, thus making their own protest before the God, that they were five, discarding and rejecting the seventh and the sixth, as having no part or lot with themselves. "No, the Delphic Officials', said Nicander the priest, speaking for them, 'believe that it is a vehicle, a form assumed by the petition addressed to the God; it has a leading place in the questions of those who consult him, and inquire, If"
Now observe clear how the Construct has been built upon Numbers, Letters, and Sounds. When Plutarch references a "protest before the God", the term "God" (yes, CAPITALIZED) refers to the Alphabet. The Letter "E" is being assigned the dialectic, or part of speech, called "the conjunction". "If this", then "that". This form of conjunction is instrumental in "reasoning", but too is necessary for willful Occult constructions. You must establish your base foundation, the "if" portion of the formula, and "then" solve for the "then" component. This may be demonstrated from the following "musing", or usage of reason and logic to solve for the Construct. The "IF" portion of the formula is that IF is a conjunction being assigned to the Letter. As Plutarch clearly shows, the Letter E is being attached to the fifth location of the Alphabet, , but the sixth and 7th is clearly being "rejected" or "protested to." E is "Five". However, simply reduce it all down. The word FIF(TH) is simply the CONJUNCTION of IF, written "forwards and backwards". "FI" is IF backwards. Combine the formula FI and IF to form FIF, add the suffix of TH as a past tense, and you have the term FIFTH. The core of the word FIFTH is the CONJUNCTION of IF written FORWARDS AND BACKWARDS. We have crafted a CONCEPTUAL FOUNDATION. Furthermore, as the Isisian Codes show, "F" is located at position number 6 and "V" is located at the number 6 position. FI is IF backwards and IV is IF with a phonetically softened sound, and yet this 6 position comprises the FIVE word. The Occult construct remains elusive to grasp even as it sits and is explained for you. Try to move our formula. You cannot, but you can try, and while you are trying, we simply take this IF-THEN pattern and extend it into the vocabulary which is further set against a "conceptual" which is further fused to Nature. 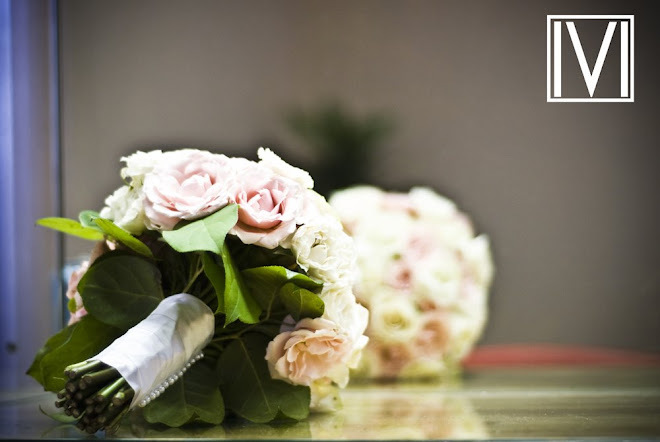 To "WED" means to "join two halves together", typically referring to "male and female" (hence, paranthetically, the rather Occult "war" on marriage as a male-female institution). If we simply reverse the word WED, we create the word DEW. In the word DEW, what we view is "conceptual point" whereupon "Geb" as Earth meets "Nut" as Sky. 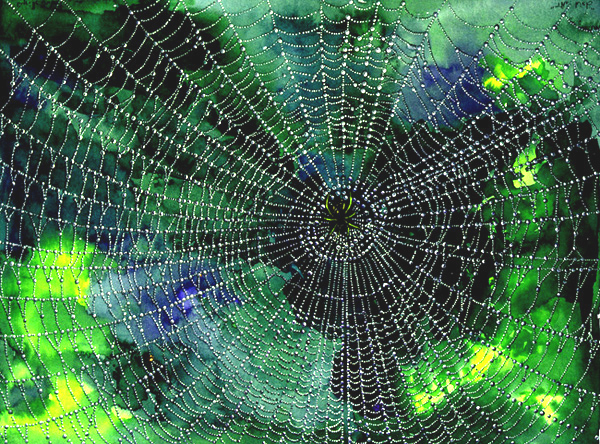 "Dew" is the physical representation of conceptual joining of these "two halves". And "IF" mountains are "1's" (the word AIN is "One" which sorta gives it away for you), and the Conceptual is based on "1's as males and "0's as females, then you should now be able to solve for the Pi proportion to this popular drink, equally. In order to better grasp the Occult signature, or code, in the word WEDDING, it might be beneficial to understand a concept that some authors call "turning objects inside out". For example, in the diagram above, the Pentagon is said to be dualistic to the Pentacle. The Pentacle as represented solely as a Pentacle (without the Pentagon shape) is said to be a representation of the Pentagon being "turned inside out". This concept is key to fabrication of Letters which are set against mathematical summations. The Letter B, for instance, is located at number 2. The formula of 1+2=3 is as the Letter B "turned inside out". We may also represent the Letter B as being "contracted", or hiding the formula letters "+2=", revealing only the 1 and the 3 as definitive shapes instrumental in the shape of the Letter B. The same holds true for the Letter D. If we turn the Letter D "inside out", what we would find is the mathematical formula of 1+2+3+4=10. The Letter B and D represent a binary expression of 2:4, which, if extended, would become the number 8, or 2:4:8. A 6 x 6 figure, or a "6 sided figure", is also known as a HEXAGON. What we find is that the Letters H and X are positioned at number 8 of the Isisian Codes and it is these two letters that are the root letters to the word for "HX"agon. The Letter B is an "inside out representation of the mathematical formal of the Sum of 1:2=3. The B comprises the center part of the formula, while the 1 and the 3 are the outer portions. This same conception holds true for the Sum of 1:4=10. D comprises the central position of the formula but is represented by the outer integers of the mathematical formula. This patterns is KEY to understanding the Occult signature embed into the word WEDDING. By now, perhaps you have enough information to begin to put the entire puzzle together yourself, but if not, we will close out this article by spoiling another really clever Occult code. When analyzing words, you can nearly bank on the philosophical co-relation of words which share similar "roots". "Roots", from an Occult perception, are consonants. Hence in the word WED, the root letters are W and D.
Taken further, if we simply write the word WED, how would really know if we are referring to "Wednesday" or the verb "WED" as in "They were wed last weekend"? You can't possibly know without some further information that helps formulate a basis for your conclusion. From an Occult perception, at the core, WED as it applies to Wednesday or a Wedding, shows no real philosophical core difference. Each word used in its context means "the joining of two halves." Wednesday is, after all, also referred to as "Hump Day", with the archetypes rapidly and easily blurring between what becomes a wedding evening and a Wednesday day. In our Western construct, we give pre-eminence to the Sun. We do not take off Saturn's day. Why would we do that? We honor the Sun and so our Western traditional day of rest is on the Sun's day, or Sunday. Further, the days of the week are crafted around Western traditional formulations, with Monday said to be referring to the Moon, while Wednesday is Wotan's day. However, the word WED NES DAY has a very simple code. The Wedding of the Sun Day. In other words, the "joining of the two halves". Thur Fri Sat = Second Half. Remember. It all goes back to Acroamatic Ciphers. Their are 26 weeks to each half of the year. The Alphabet is 26 Letters, representing each of these two halves. The Alphabet must be understood to be "joined" at "two halves", or to at minimum, continue on in an unbroken string from A-Z-A-Z and so forth. And then, of course, there are additional ciphers created from such a conceptual process. But for this demonstration, lets simply join the Alphabet at (ZA). Well, because we can encode our philosophy and hide it all in plain site. By focusing even more narrowly, we understand that Wednesday is a "correlational hump day", meaning that we can set the week into a Pi Proportion by considering 1 week to be "1 circle", and hence WD would be the Center, but REPRESENTED BY THE OUTER FORMS OF THE FORMULA. The Letters W and D become the outer formula of the inner representation (day) through the "joining of the two halves" at ZA. Then again...we do go back to ISIS and Osiris. Isis was married to Osiris and Osiris is said to have been killed by Seth. Brides marry Grooms. If we reverse the word GROOM, we arrive at MOORG - a place where the dead (Osiris) are taken. Could this be yet another pun delivered by a hidden elite to hide Osirian secrets from the Setianists? "Monotheism" is a recipe for totalitarianism. After all, a people who have made their living preaching that "thou shall have no other gods before you" and then pronouncing a death sentence for a violation of such a law is hardly a people prone to benevolence and charity. More to the point - the philosophy is designed to enable and perpetuate ignorance and intolerance through providing a moral and ethical framework upon which to persecute others. Views and perspectives become stifled by they who rely on and prefer the use of force - afterall - the Earth was formed in 7 days and there is no need to go beyond such questioning. So saith the core practitioners of "monotheism". All people must be slaughtered who reside on the land of our mythical forefathers - so saith the practitioners of "monotheism". Visit Israel if you wish to come to understand the total dark nature of such a life force, if indeed a "life force" is what it could be called. The belief in such a force brought about rise of the Medieval Period in Europe, and it was the protest against such force that gave rise to "Secret Societies". Those who are in a position to preach history today ignore such concepts as "chivalry" and the fount from which such ideas sprang. Those who preach history today would have you believe that the builders of Carnac and the framers of the Constitution were motivated by some "satanic dark force" bent on creating the machinery to enslave humanity. "Denial" of facts is simply a weapon used in the service of they who create religions that result in "punishments" for those who "preach denial". How many souls have been remanded from their countries to serve trial for disagreeing with the history of others? What a savage and primitive people are the inquisitioners. Beware of the ideas conjured by they who preach "monotheism". Letters are binding agents. The very act of "spelling" a word creates the defacto Occult reality of "crafting a spell". Those who speak of "casting spells" as if the very act is "evil" have not fully rationally thought the process through: writing and speaking are but forms of spell casting. This is not so difficult to demonstrate. Grab a piece of blank paper and stare at the blankness of the paper. What comes to mind? Then draw any given letter, and refine same into a word. What happens to your thoughts? They become increasingly focused, and shades of imagery become discernible amongst the shadows. Manley P. Hall mentioned this very practice in one of this voluminous works, although I cannot remember where. Now carry the thought further to the ramblings and rantings of politicians and so forth. With each spell of "terrorists" and "9-11", a crafted reality, absurd as it may be, becomes "believed" by a large enough core of the masses. As the core increases, the demands to remand the parasitic force is neutralized by the core of ignorance as defined by they who "believe". The "spell" is really no more difficult than a simple and yet massive lie created in the aether using nothing but words. With each newspaper article, electronic newscast, and so forth, the lie is reinforced. The masses are, really, too naive to comprehend the total planned conspiratorial nature of the agenda. So blindly, they "believe". Be the Lie of Eve. But our system and philosophy is designed to shed light on the absurdities of parasitic Occult force, and perhaps a comprehensive analysis of the words "GOD" and "MONOTHEISM" will provide an insightful demonstration of how this might be so. A Gematria Analysis of "GOD"
I believe it is Voltaire who said, "Those who can make you believe absurdities can make you commit atrocities." It is for this reason alone that provides value to such works as this: through your efforts to peer through crafted absurdities, you are greatly strengthened such as to preclude efforts to have you commit (or support) the committing of atrocities. How many crimes have been committed in the name of "GOD", for instance? How much support for the committing of atrocities continues in the name of "GOD"? Why allow a foreign culture to define the word? These same channels would have you believe that "torture" is not so, and that indefinite detainment without charge is an acceptable form of human behavior. The insane precocious holier than thou mentality we view today is in essence no different than the insanity of the Inquisitioners of the Medieval period. GOD is a very very simple word. G+O+D = 26. This is the Pi Proportion to the number of weeks in a year. Divide 52 weeks by 2 to acquire the co-relational diameter in time of the Earth's orbit around the Sun and you arrive at the number 26, or the Pi Proportion. Utilizing a basic truth to craft a mountain of lies is the very fabrication of parasitic Occult force. Pull out the basic truth. If GOD is the DIAMETER, then GODDESS MUST BE THE CIRCUMFERENCE, for the whole is based on the WORD, which is PI. English is an ESOTERIC CODE based on the GODDESS ISIS. (H) is Pi - which completes the circle. Even the word ENGLAND can be reduced to a very simple cipher. H is but the ending, which is like wrapping a spell in a circle, which is Pi. Even YHVH is said to have a value of 26 - BUT THIS IS AN ABSURDITY. The lazy assumption is that you are able to make a 1:1 co-relation between the Hebrew and the English, which is false. 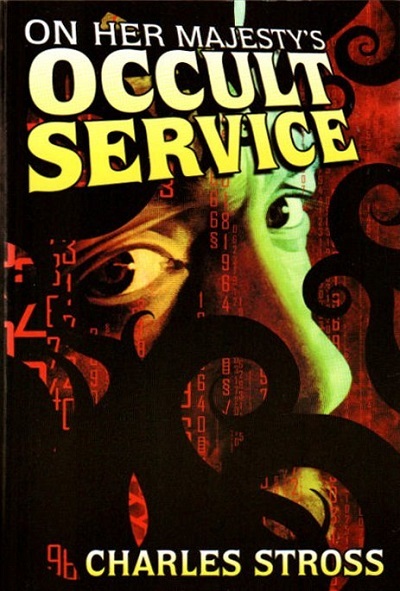 To try creates the insanities of Crowley and his drug induced stupors. How do you transpose the Letters YHVH as an English construct to such as to equal 26? Now TRY to turn it into 26, and leave off the absurdity of one culture imposing itself onto the other. The reality is that such is an absurdity and belies the design of English as an Occult construct. Yet YHVH must equal 26, but HOW? Through the use of the Isisian Codes. All of these names are CO-RELATIONAL DIAMETERS and represent the MALE COMPONENT. Pretending, or choosing to remain in a state of denial, ie, "A Goddess Denier? ", simply puts one into the believing an absurdity. Is "Goddess Denial" a crime that should be enshrined as a tool equally? Do you hear the language of the modern day inquisitioner echoing around and with it their absurd style of thinking? The Esoterics of the Word "THE"
If one peers deeper into such Mystery Schools as Freemasonry and Rosicrucianism, what one finds is that the systems are in reality "cryptic Goddess worship". These systems preserved the knowledge of the Sacred Feminine in the face of overwhelming brutality and ignorance of the Monotheists. As I delved further into these matters, it became clear that one could take two paths to "getting it", or, as was hinted at in the Matrix Reloaded, to come to understand WHY. WHY is, of course, a cryptic formula for the Pythagorean Theorem. But what of the word THE, and the philosophies contained therein? After all, the word THE plays prominently in such words as THE-OLOGY, THE-ORY, THE_SPIAN, and of course MONO-THE-ISM. So what PRECISELY is THE? What we know is that THE as a word, relative to the English Construct, "precedes all things". It is not modified regardless of whether it precedes a thing (singular) or "things" (plural). Perhaps this is unfair and makes the word difficult to decipher. After all, Spanish uses the word EL (L) and the word LOS, which is simply SOL in reverse. 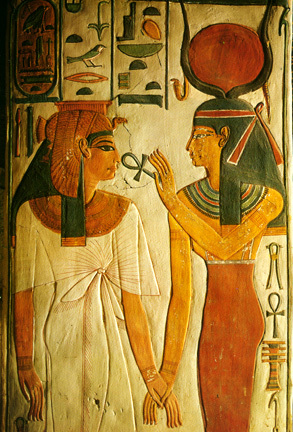 Each could be seen as pretty obvious uses, for EL is traditionally seen as Osiris and Osiris is seen as "the Sun", while LOS is SOL is the Sun again. And what, precisely, has been LOST save for Occult or esoteric knowledge of SOL and T? And of course the oddities of English become puzzling. When "A" is attached to a word, it means "NOT" and when separated from a word it means "IS", hence an "ATHEIST" is NOT A Theist while A THEIST IS a Theist. In this case, THEIST means that the root THE is meaning GOD, but we have already defined GOD as being the Diameter in Time, corelationally speaking, of course, of the Earth's Orbit around the Sun. And since A is 1 and Mono is 1 the same, is not a "monotheist" an "atheist" by default? Can you see how the system is crafted to reveal the inherent absurdities? And what EXACTLY is THE? THE clearly comes before all things, and THE is equally being equated to GOD, but is it REALLY GOD? If so, then PROVE IT, for our system is complete and unerring, or so we are led to demonstrate and show. THE is a mathematical pictogram. Hence we find in the archeological record that the Sky was the Feminine (the Sun) and the Earth was the Masculine, for it was the Earth God Geb who mated with the Sky Goddess Nut. This would be later changed to Male Sun and Female Earth, but in all cases the Feminine played paramount, as She should.